I have just spent two days staying with a mate in Halifax. Christian and I use to fish together during our uni days chasing Mackerel off the end of the break wall. 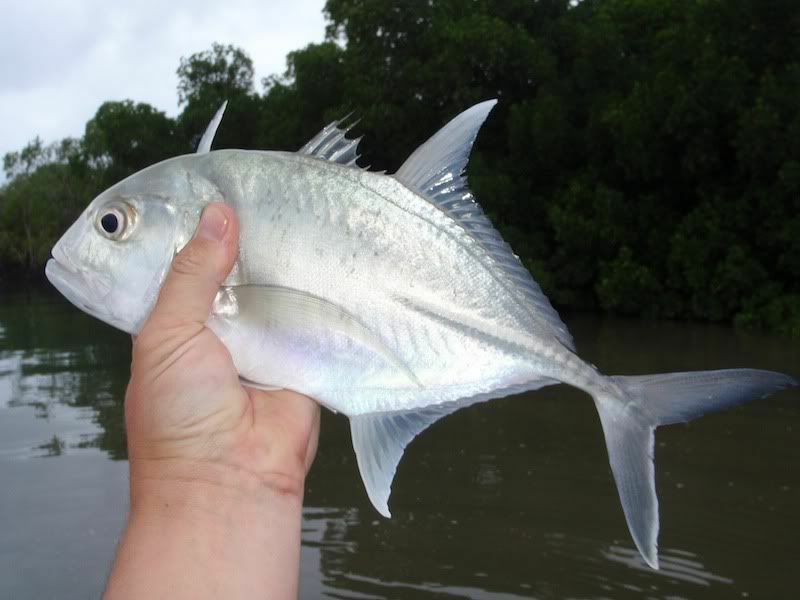 But he moved away to Cairns and since then we have only fished together once or twice. He has now brought a house in Halifax, so I can see us getting to fish together a lot more. I drove the tinnie up to his place Monday lunchtime and by about 2.30 we were in the water and off for an afternoon session. Christian is quite new to the soft plastics game, so I was keen to get him connected to a few fish on the lighter lines. But I was also a little concerned thats it July and we were fishing an area I knew zip about! We would be fishing the last of a smallish incoming tide. While the tide wasn't big, it was in the building phase and presented us with a nice steady flow and crystal clear water. 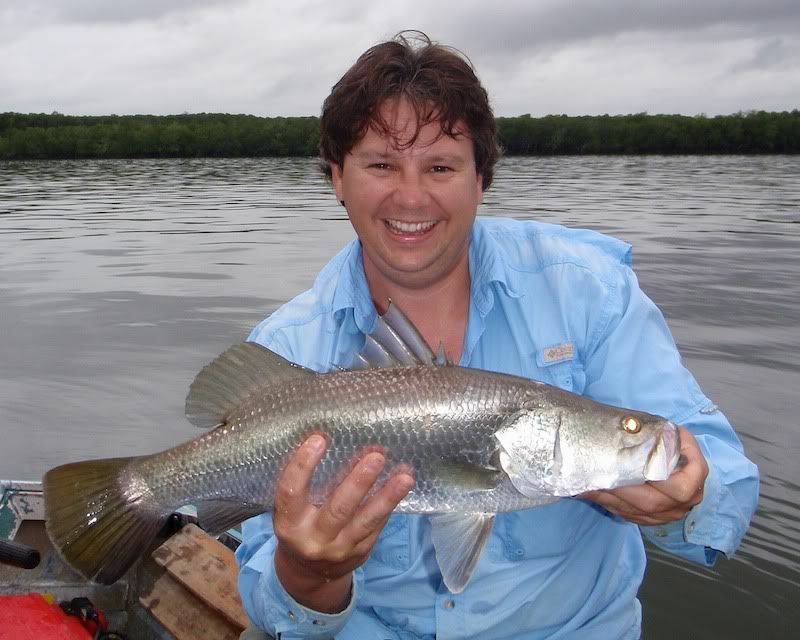 I stuck with the idea that fish should be moving up onto the flats with tide and into warmer water. So off to the mouth of a river we headed. There was only about 90cm of water over the sand, but easily enough for the tinnie and plenty to hold some fish. We headed for some timber that was sticking up out of the water. I was anticipating some flathead feeding on bait that was holding around the structure, but was also hopeful for a Barramundi! We threw plastics at this tree for about 20 minutes with not much more than a bump. Then Christian got caught up and we had to go in for a retrieval. As we neared the timber we could see fish moving around in the crystal clear waters. 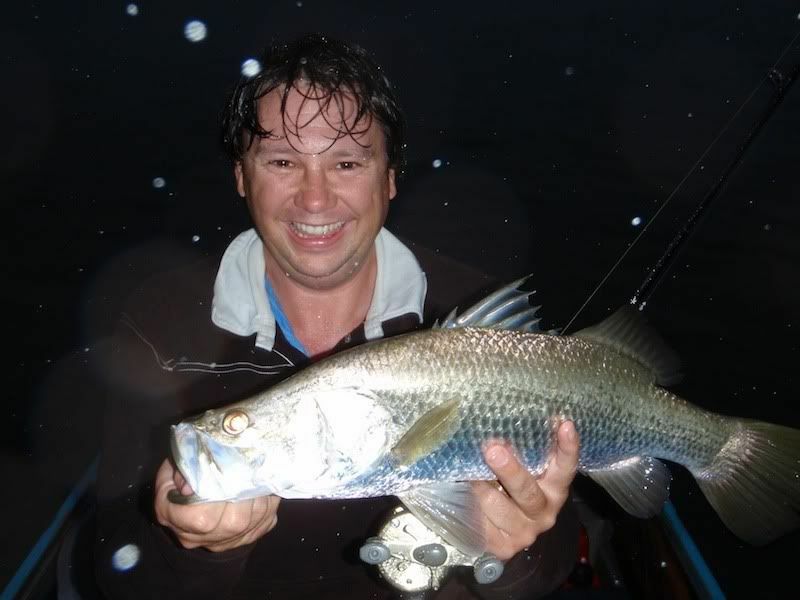 There were Bream that would have been well over the 30cm mark, and 4 or 5 rat Barra! So we got the lure off and backed away as quietly as we could. We downsized the plastics in an attempt to snag a Bream, and I pulled out the bait-caster that had a gold Flatz Rat attached. Even though a Flatz Rat is a deep diving lure, and we were in less than 1m of water, its a floating lure so can be worked gently without pounding it into the bottom. So I threw it to the timber, jerked it hard to get it down deep, then let it sit for a count of 3. In that count of 3 it floats up a little and can then be jiggled back down. This slow retrieve can keep the lure at the critical depth an keeps it close to the timber for a long time. In fact, you can even work a Flatz Rat just under the surface in the same way. It only took a couple of casts and I was hooked to a nice little Barra. He was quickly netted and measured at 55cm. A quick photo and he was on his way again. We couldn't tempt any more fish from this snag, so we moved on to some more good looking structure. 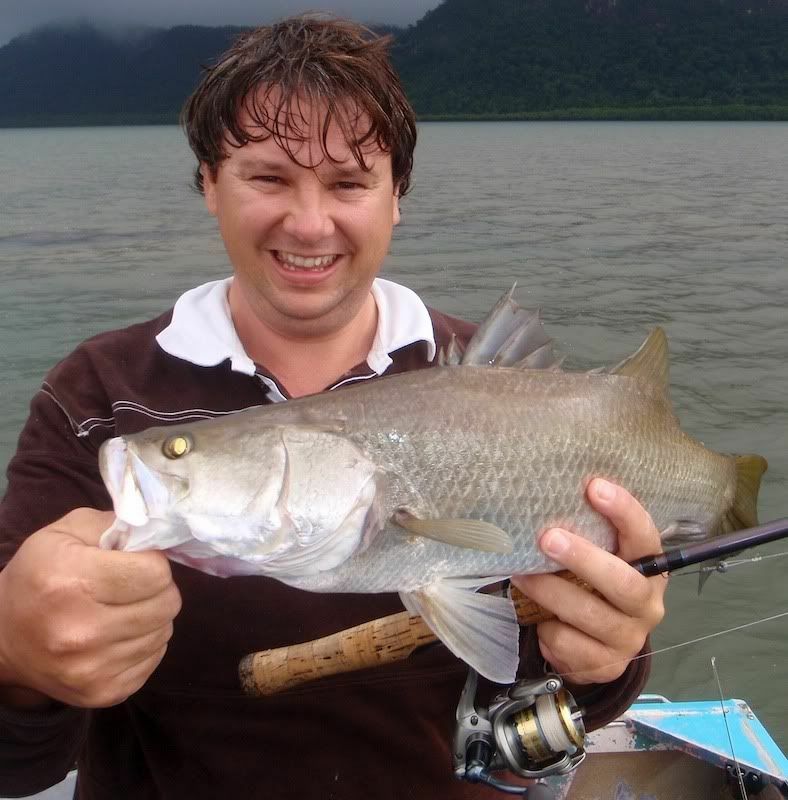 Thats one thing about Hinchinbrook, there are always plenty of places to try! We were not here long and I was hooked up to a nice fish. This one was on a 5in Strike Bait. 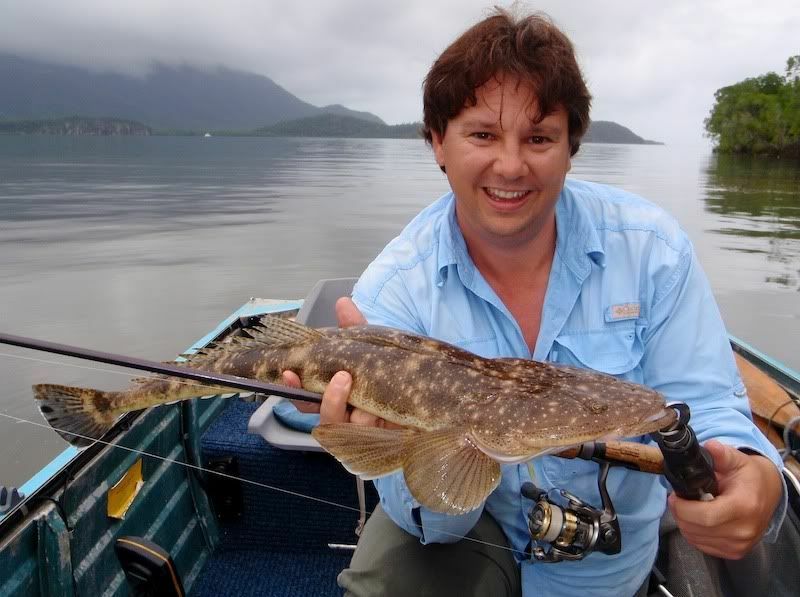 With this style of lure I was anticipating another rat barra, but it turned out to be a nice Flathead. Measuring about 58cm it was soon in the eski for our dinner! Christian managed a couple of hookups, but both time the fish threw the hooks pretty quickly. But this was enough to get him excited and keen to keep trying this very addictive style of fishing. We moved to another flat to the inside corner of the river. There was a mass of small herring moving off the flat as the tide topped out, and fish and big rays were moving all over the area. It didn't take long and I was hooked up to another good flathead, and then another! With enough already in the eski for dinner I was happy to let the remainder of our fish go. As the water fell from the flat we moved off and fished the deeper drop off, we got a few small trevally and Christian landed a big Wolf herring that was kept for a spanish mackerel bait. It was now getting dark and we had to find our way back through the maze of sand bars to the ramp, so we headed off. We thought 1 Barra and 3 flathead over 55cm was pretty good, and anticipations for the following morning were now very high! Day two and we headed straight for the little barra snag. It was rainy and cold and the sun was only just showing first light. We were cold, but ready for a fish. I went straight for the HB while Christian stuck to the plastics. We made a few casts with no success. Christian again hooked up on the structure and was pulling at it wiggling the stick that was sticking up out of the water. Hold on I said, I just want a few more casts. 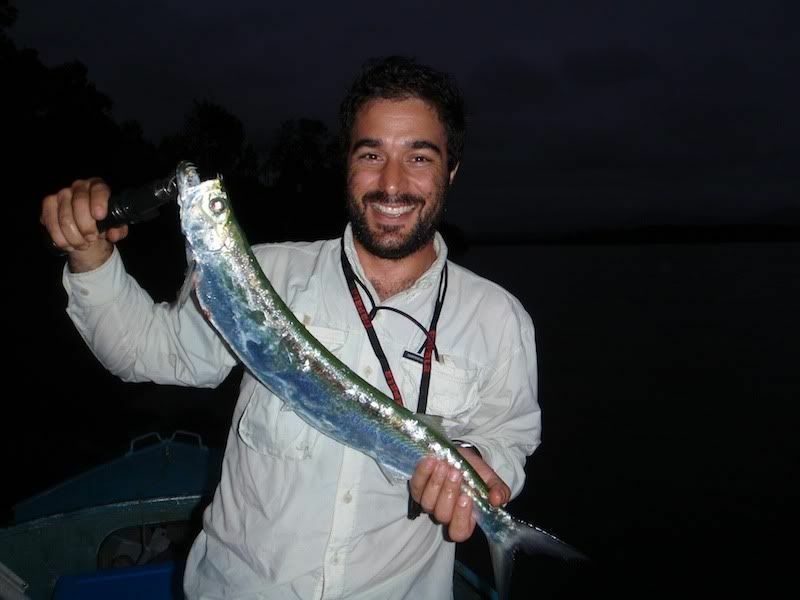 Bang, I was connected to another Barramundi! I think Christian's shaking of the log had woken them up!! Another fish of 55cm was photographed and returned to the water. We spent the remainder of the morning moving from stick to stick as the tide fell from the flat. In some places there was only just enough water for the small boat to move through on shallow run, but it was enough for the fish. 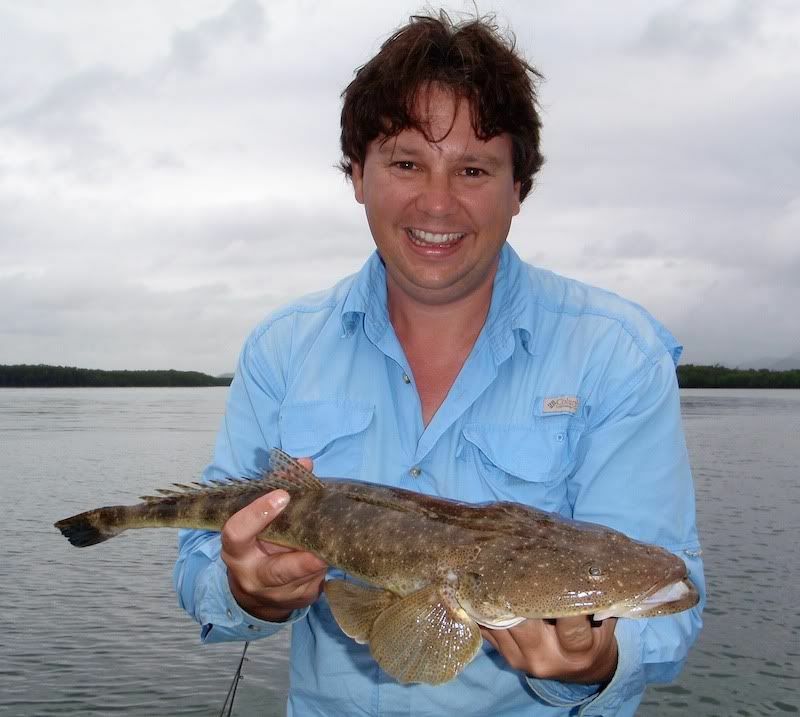 By the time we were forced off the flat at about 11am we had caught and released almost 20 flathead and 5 barra. 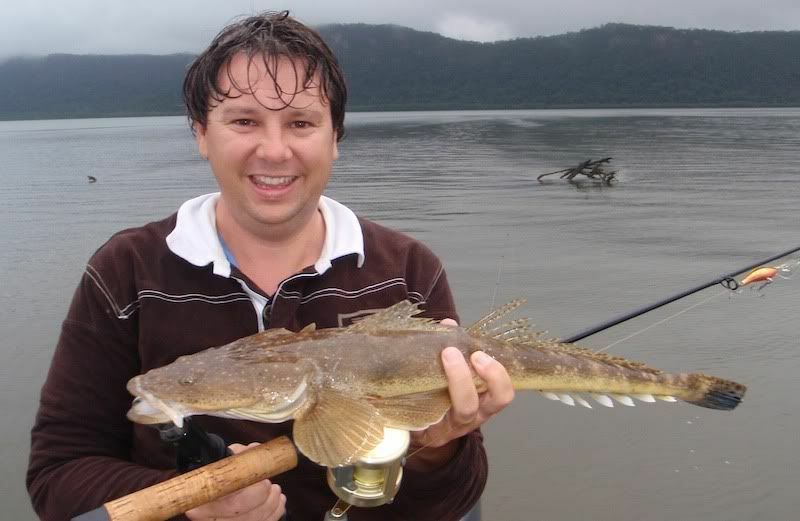 Not one flathead was smaller than 55cm, and the biggest just nudged 70cm. Most were about 60-65cm. 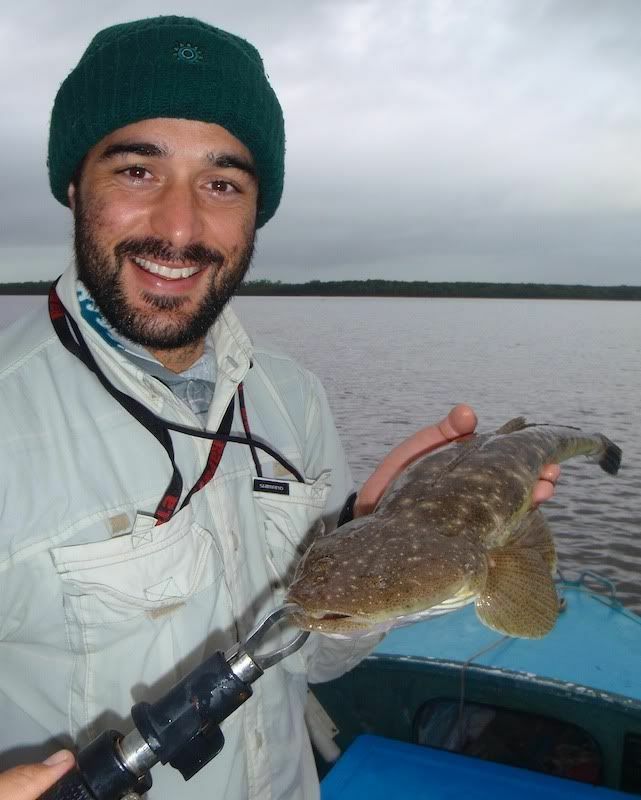 We even experienced a double hookup of 60cm flathead, and a double hookup of a flathead and a barra! 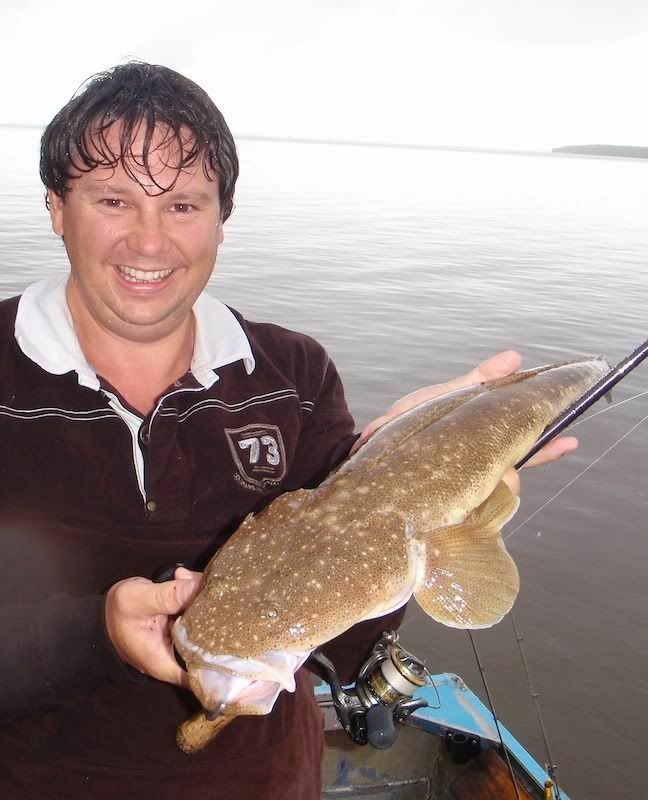 This is the best flathead fishing I have ever experienced, and one of the most fun sessions in an estuary I have ever had. Christian is now well and truly hooked on plastics and is keen to have another session in the tinnie soon! I know I can't wait.